The following document was obtained from the Interagency Airspace Coordination website. 0.1 The Airspace Management Plan for Disasters provides a nationally consistent framework and suite of supportive tools for the use of the Federal Aviation Administration’s air traffic and airspace management operational expertise and capabilities, as well as statutory authority, to enhance the safety and effectiveness (including unity of effort) of air missions supporting response and recovery efforts such as Search and Recue flights following a disaster. The plan also speaks to the use of these tools to safeguard persons and property on the ground. Additionally, this plan also helps to balance the needs of those response air missions with the agency’s concurrent effort to return the National Airspace System, which is critical to the U.S. economy and American way of life, to normal operations. Note that the Federal Aviation Administration also uses operational contingency plans and other air traffic management procedures, which are separate from this document, that specifically focus on sustaining the operation of the National Airspace System and normal air traffic, especially for situations involving the disruption or degrading of the agency’s Air Navigation Services. 0.2 Federal, State, and local agency, as well as military, partners are the primary intended audience of this document. This plan is also provides a coordination resource for those Federal Aviation Administration operations personnel who regularly cooperate with interagency partners on the use of air traffic and airspace management capabilities to support response and recovery efforts. 0.3 The plan is informed by numerous natural disasters that have struck the country since Hurricane Katrina in 2005, as well as many national and State-level exercises. Reflecting the lessons learned from those events, the plan is designed to be implemented in a scalable and flexible manner that best meets the operational needs shaped by the specific disaster at hand and the requirements of the responding Federal, State, local, tribal / territorial, and private sector stakeholders. Implementation of this plan can be carried out for any disaster provoking the need for response and recover air missions or otherwise involving the National Airspace System, including events to which the Federal Government is responding through the Stafford Disaster Relief and Emergency Assistance Act and purely State or local crises. In many cases, the Federal Aviation Administration will implement this plan initially in cooperation with State level authorities, including State Emergency Management Agencies and National Guard units, and then, as the disaster unfolds, scale up implementation as Federal assistance, including response aircraft begin to arrive in theater. Elements of this plan may also be used to facilitate air operations regularly flown by the U.S. Forest Service, Bureau of Land Management, and National Park Service to support, for example, wildfire firefighting, law enforcement, and search and resure missions. 0.4 The plan is not intended as a stand alone document. It is intended to be implemented through Federal Aviation Administration Temporary Flight Restrictions and other operational measures. 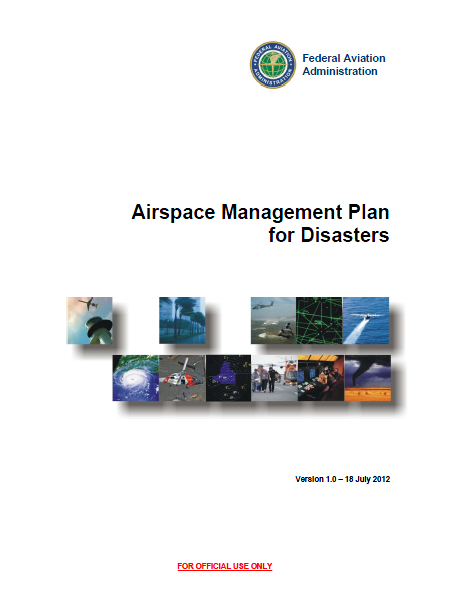 The plan is also designed to provide air traffic and airspace management input to a broad range of other aviation centric disaster response and recovery plans and procedures used by U.S. Northern Command, United States Coast Guard, Customs and Border Protection, the State Emergency Management Agencies and National Guard elements, and other Federal, State, local, territorial / tribal interagency partners. In addition, it is intended to complement the National Response Framework and other related disaster response and recovery plans.